Councilmember Mike Bonin cuts the ribbon for the Milton Green Street. All photos: Joe Linton/Streetsblog L.A. 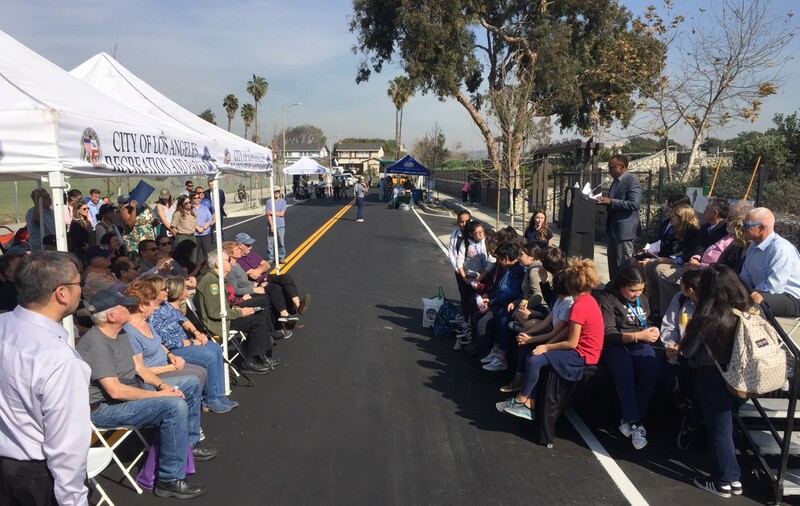 Yesterday, the Los Angeles neighborhood of Del Rey celebrated the opening of the Milton Green Street. Residents, students, elected officials, and civil servants cut the ribbon on street improvements to a long block of Milton Street that has been retrofitted to be safer, calmer, more natural, and more ecological. The Milton Green Street project extends a fifth of a mile between Westlawn Avenue and Mascagni Street. On the northwest side of the street is Marina Del Rey Middle School. 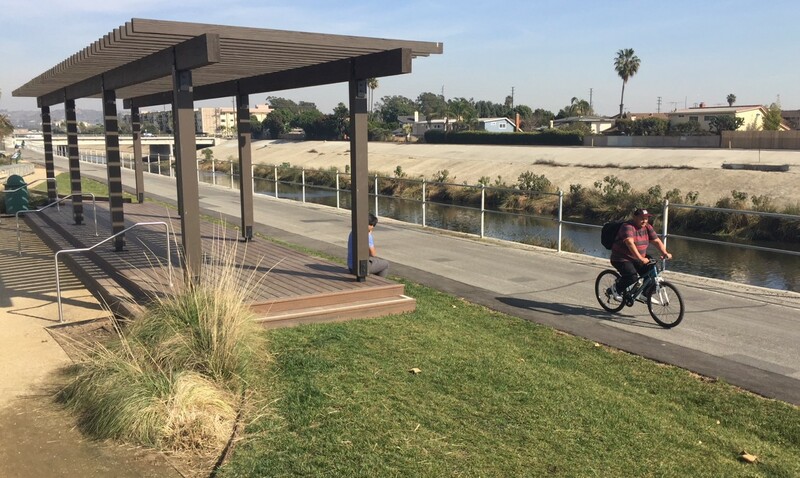 To the southeast is Ballona Creek and its popular bike/walk path. 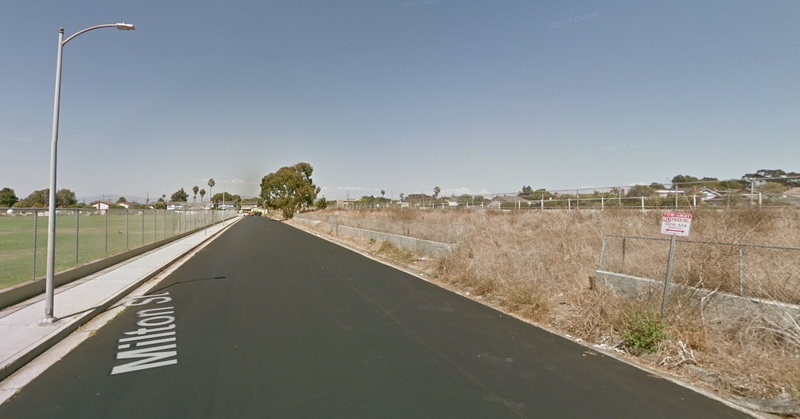 In recent years, communities and governmental agencies have worked to implement a greenway along Ballona Creek. 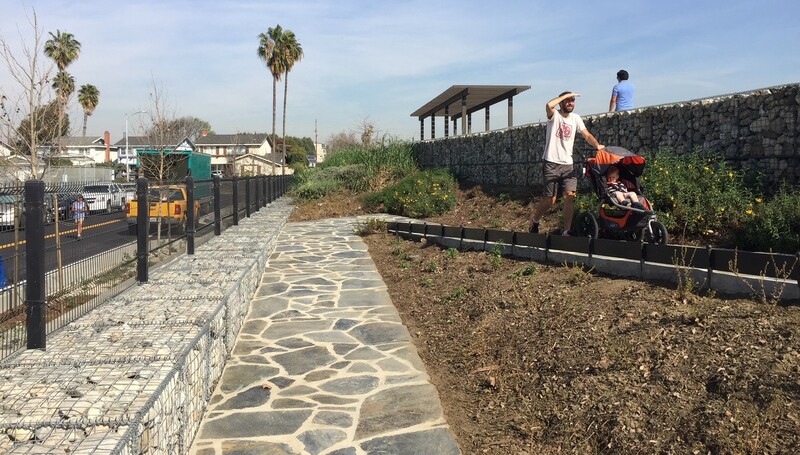 What was formerly a bare-bones access road converted into a bike path, is now lined with small parks, welcoming gates, native vegetation, and more. The Milton Green Street is a component of a small linear park, Milton Street Park, which opened in 2016. 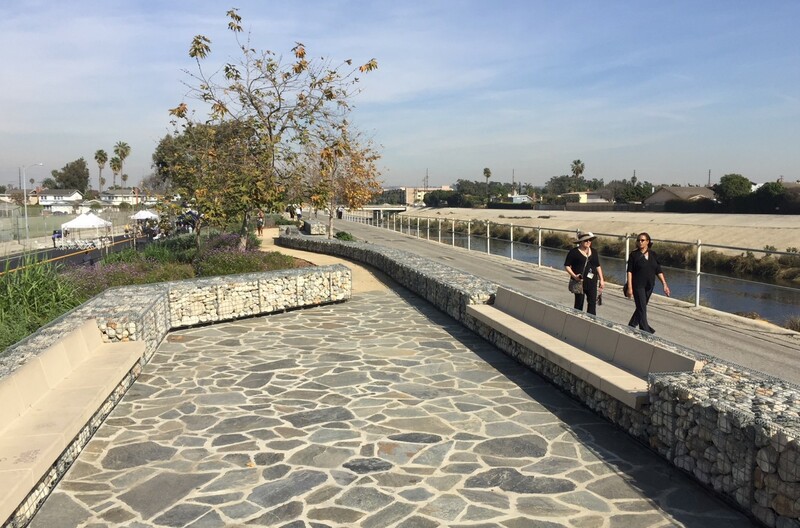 The 1,000-foot-long 45-foot-wide park features native trees, bioswales, seating areas, walking paths, ramp and stairs. The park creates an attractive access point that connects the school with the creek trail. The green street project includes just over a dozen landscaped bulb-outs that capture and infiltrate street run-off. These small basins clean water naturally, instead of doing what traditionally engineered streets commonly do, which is to dump pollutants into creeks, rivers, and the ocean. The bulb-outs also serve to narrow the street, which slows down traffic and makes shorter, safer crossings for pedestrians. 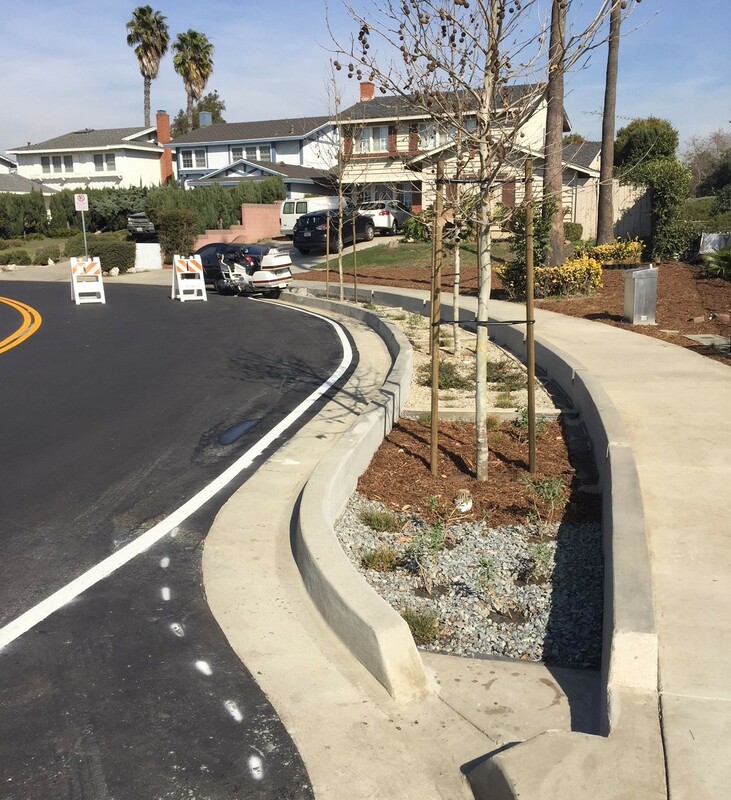 The street and park improvements were a collaborative effort of the Balwin Hills Conservancy, the Baldwin Hills Regional Conservation Authority, the Mountains Recreation and Conservation Authority, and the Los Angeles City Bureau of Sanitation. 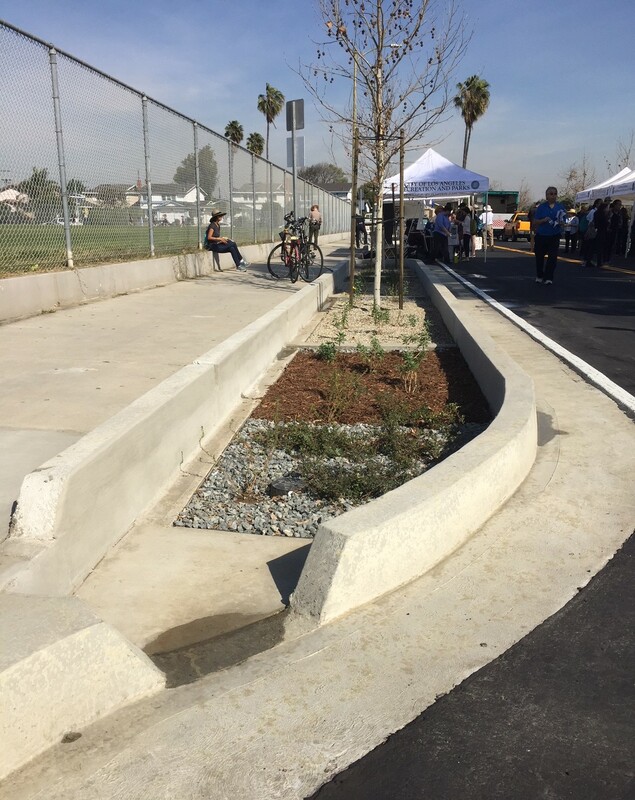 At yesterday’s ribbon-cutting, several speakers praised Los Angeles City Councilmember Mike Bonin not only for his role in marshaling city forces to get the green street project built but also for his leadership in making L.A. streets safer. 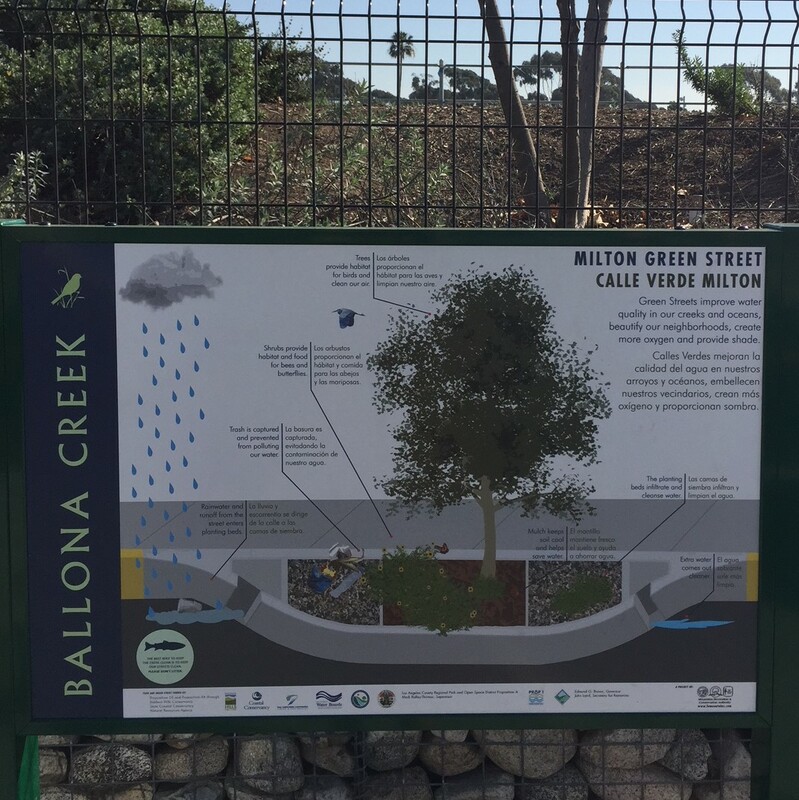 Councilmember Bonin touted the multi-benefit Milton Street project for cleaning water, creating a safe route to school, and serving as a classroom that connects people with the sacred beauty of the natural world. Hopefully this won’t just turn into a homeless encampment.